If you don't have The Late Late Show with James Corden in your DVR rotation you should, because he crushes it with hilarity. Wednesday night Corden went through the complicated list of the 1200 people who have officially filed to run for President of the United States. He began with a serious conversation that occurred on CNN when Jeb Bush was asked to comment on his fellow candidates. Bush said that both Marco Rubio and Donald Trump "need to put [their] big boy pants on. "Corden called it Bush's trademark maturity. "Those are fighting words. Let's not start throwing around this hard language so early in the campaign. Big boy pants? I mean, what's next? Jeb Bush issuing a press release that Ted Cruz is a giant poopie head? Although, in fairness, Ted Cruz is a giant poopie head." Corden says if you're looking at the list of 20 or so major candidates on both sides and not liking any of them, you're not alone. No fear, because you have over a thousand more to choose from. 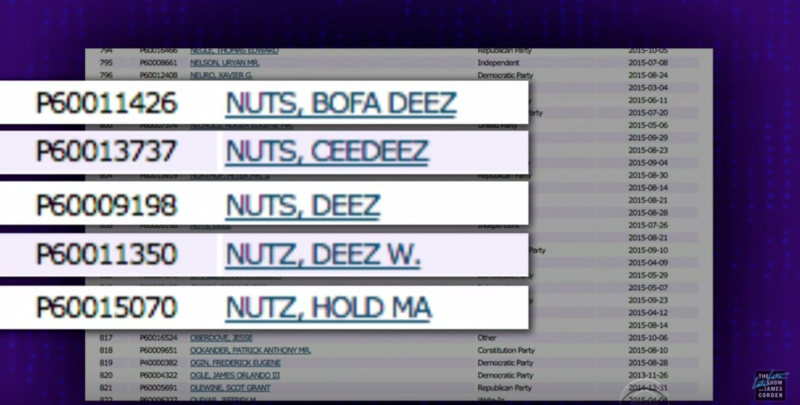 At this point you've likely heard of candidate Deez Nuts, but did you know his brother Deez W. Nuts is also running. "You would think there would only be two Nuts,"Corden said. But there's actually CeeDeez Nuts and Hold Ma Nuts are also running. It's the whole Nuts family! This is important for the American voter, because most thought the GOP held the only nuts in the race. Deez Nuts and family are bipartisan in their appeal. ButCorden asks an important question about the political family: "Do we really want to have a Bush dynasty and a Nuts dynasty?" Other candidates for president include, and these are completely real, Drew P. Weenur and Dat Phat A$$ (who is already starting to get coverage). "I don't know if I would vote for Drew P. Weenur,"Corden said. "Because I hear he leans a little to the left." But at least you can tell the people on the list are honest,Corden says. "Because you can tell they're a joke the second you hear their names. Whereas the leading republican candidates are funny in like a 'ha, ha! I'm moving my family back to England' kind of way." Corden has now pledged to invite one candidate from the list of 1200 to speak on the show. This should get interesting.